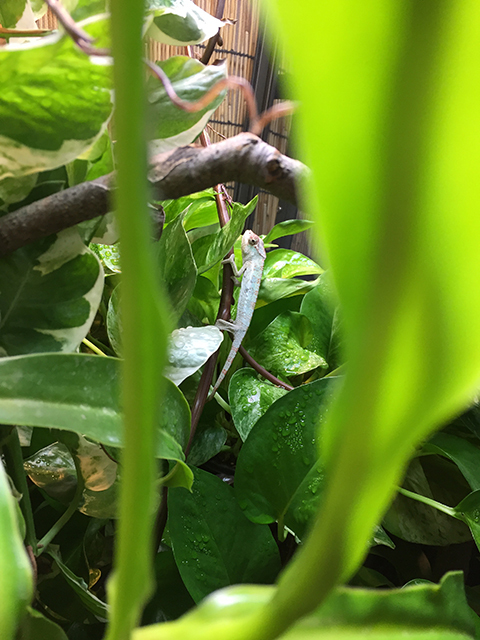 We in the chameleon community have had a curious habit of using grow out cages for our juvenile single pet chameleons. 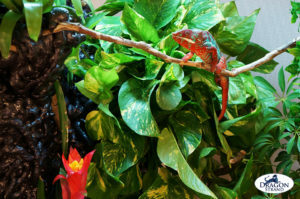 This practice advocates using a small cage to grow the chameleon up until adulthood. It is then transferred to the adult size cage. The thinking is that the baby chameleon can find food, water, and basking spot easier in a smaller space. 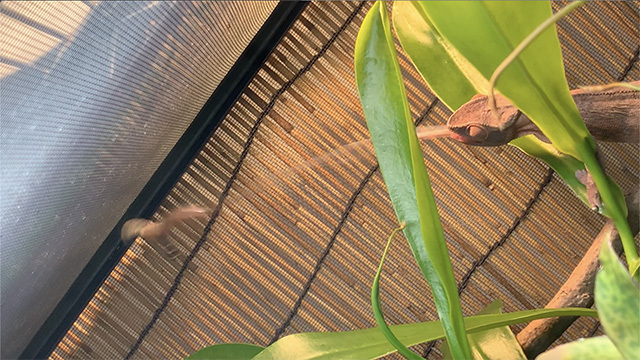 So we have a two cage lifecycle for our chameleon. As a cage manufacturer, this is a wonderful protocol and, perhaps, we should add in a subadult cage in the progression so they can hold onto their childhood just a bit longer. 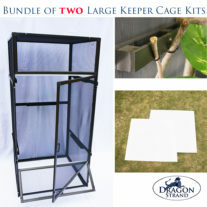 I would be happy to create a three cage bundle I can call the “Growing Up Cage Kit”! But as a community educator I need to present the truth that you need only one cage for your chameleon from hatching to full adult. 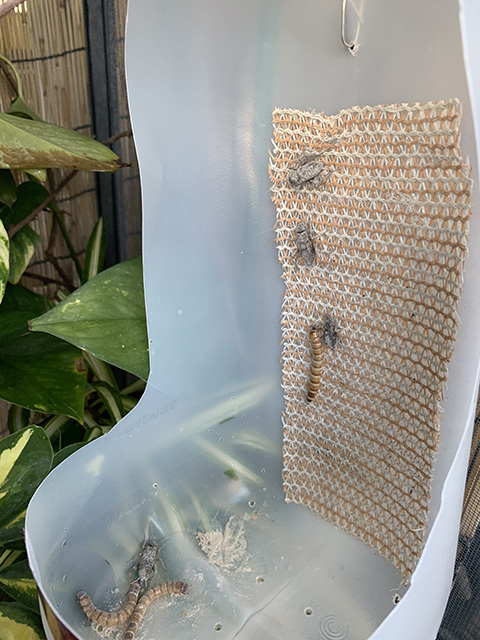 Your baby chameleon will have great freedom starting off in their adult cage and will grow up comfortable in its final home. How will they find food in such a big cage?!? Chameleons are designed to be self-sufficient from the moment they hatch out of the egg. Their first missions in life are to find food and safety do they can grow up as fast as they can. And they do this within a continent sized enclosure. 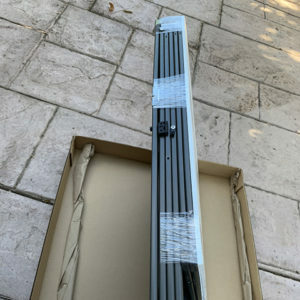 It will be controversial for me to say to keep your hatchlings in a Large Keeper 48” size cage. (I have done it with great success, by the way). My purpose here is not to convince breeders to change their care protocols, but to speak directly with the keepers who are buying one three month old baby and are making first time caging decisions. They are self-sufficient out of the egg. By three months they are now highly experienced in how this captivity situation works. It really isn’t that hard. Feeder bowl = food; strange big foot creature = food and bizarre camera thing that must die; Proper Cage = border of protection. 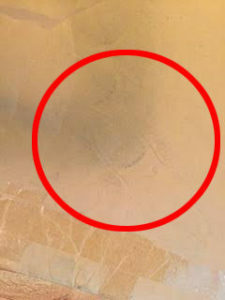 The difference between a two foot tall and four foot tall cage is immaterial to a chameleon whose main sense is sight. They know exactly where everything is in that cage. Feeder behavior is an issue in any size cage. Specifically we are talking about feeders hiding under pots and in the plants. 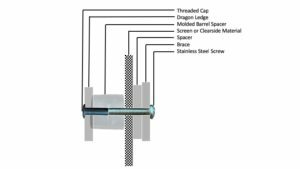 This is the use and purpose of those feeder run cups. 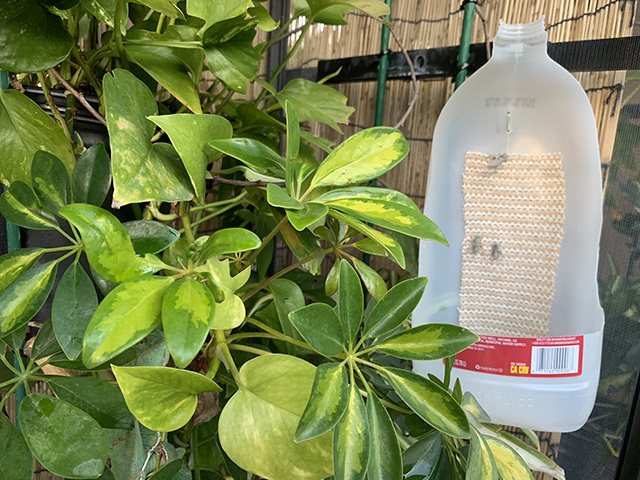 Have one place where you hang the feeder run cup and make sure there is a perching branch conveniently placed nearby with easy tongue slinging access. 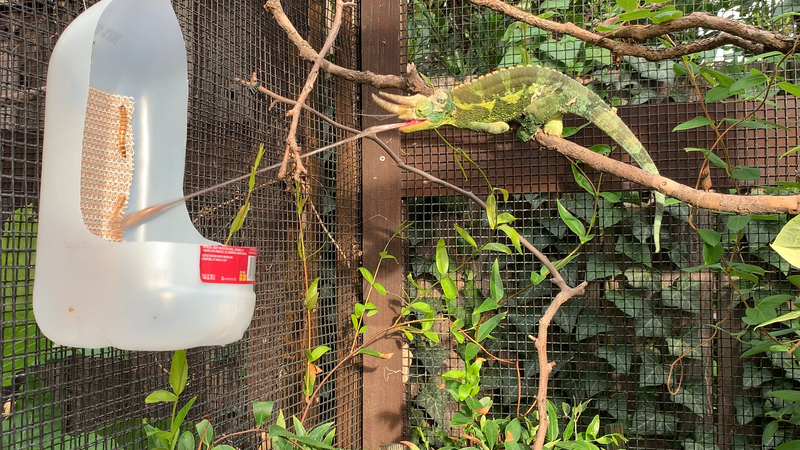 If you hang the feeder in the same place at the same time every day you will be surprised to find your chameleon on his eating branch ready and waiting for you at feeding time. Chameleons are quite smart – especially when it comes to food. 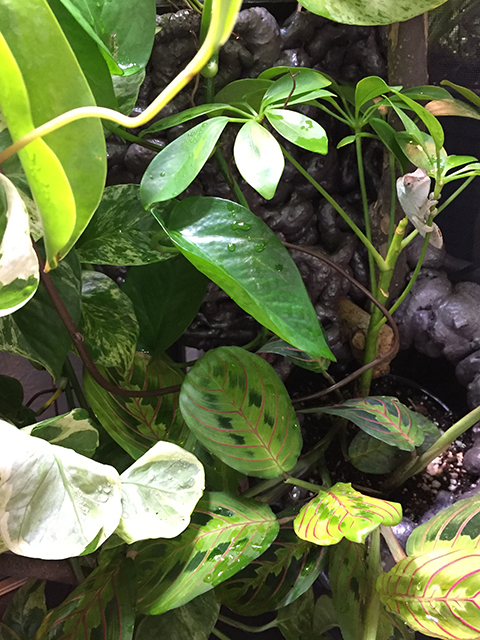 Understanding chameleon behavior you can create a dense leafy area where you suspect your chameleon will sleep and a basking spot where your chameleon will warm up in the morning. Your job is to simply provide the environment. Trust that your chameleon will do his part in figuring out how to be where he needs to be. In the end, not only will I say you are fine getting the adult cage right away, I will actively encourage you to do so. With the smaller body of a juvenile you can create very diverse areas and enjoy watching behavior and habits change as he grows up. This is only possible if there is enough room in the cage to have options to choose from. 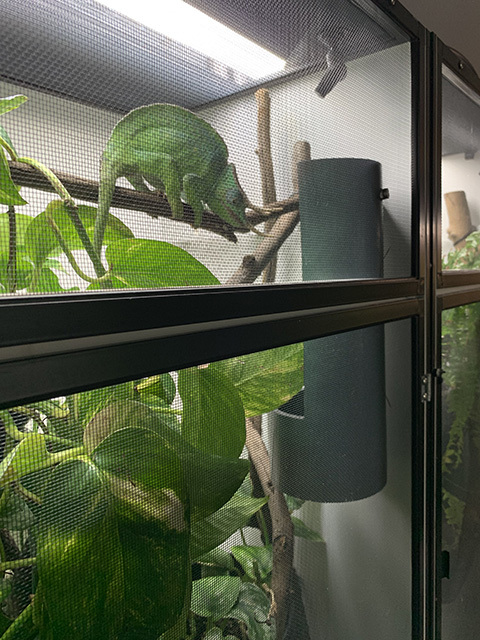 For standard size chameleons including the panther chameleon, veiled chameleon, and Jackson’s chameleon, the Large Keeper Kit is the most commonly used successfully from baby to adulthood. 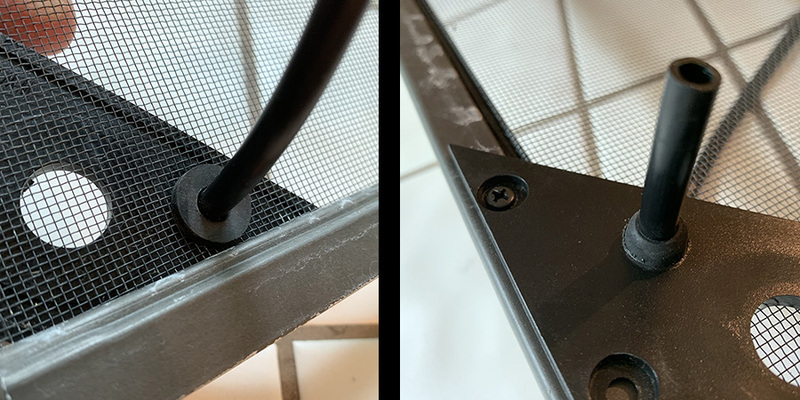 But even if you get the Large Atrium Enclosure, do not go through the effort of building a false bottom within the cage. This is absolutely not necessary. The best that can be said about it is that it is not a dangerous practice. But, honestly, it is sad for you to deprive yourself of having all the space to build a beautiful home for your baby chameleon. A baby chameleon in a large adult cage will have many microclimates and gradients to choose from. In a large cage with many options your baby chameleon will have many places to choose a sleeping spot from. 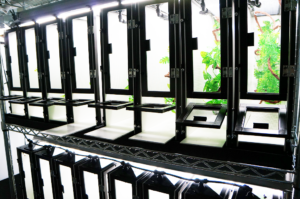 Smaller “grow out” areas are a necessity for breeding groups because of the need to be efficient with space. 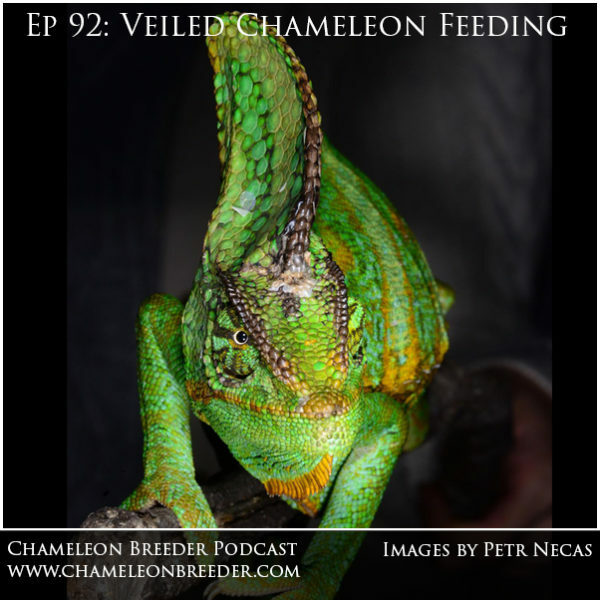 They are especially useful for panther chameleon breeding projects where you want to select your next breeding generation from panthers that are colored up. But a grow out cage has no place in pet keeping. This is one of those cultural folklores that needs to be retired. Your social media advisors may continue to advise it as it is one of those safe concepts that hasn’t been challenged. It isn’t dangerous to the chameleon so we won’t attack it too fiercely, but just know, you don’t have to do it. I would like to invite you to join an educational outreach effort I am doing on the Facebook group The Chameleon Enthusiasts. It is a tour of the world’s chameleon species meant to give a look into the diversity that are found within chameleon species. I have teamed up with Jurgen Van Overbeke who is one of the community’s most experienced breeders. Every Monday we will highlight another species. We have started on the west coast of Africa in the lowlands of Cameroon and we will slowly make our way across the continent and to the outer reaches of where chameleons live. These will be short bite-sized profile introductions. So far, we have covered Trioceros cristatus, Trioceros oweni, and Rhampholeon spectrum. We will be working our way up in elevation to cover the prominent species of Cameroon before moving to Uganda. 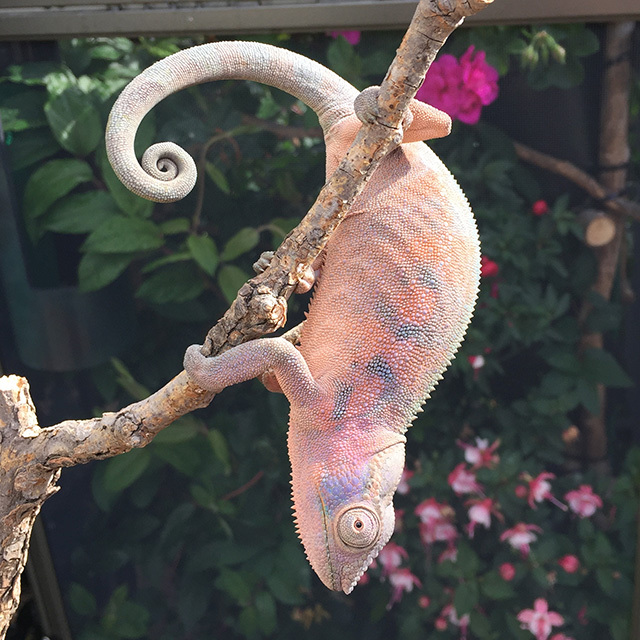 To check out the full profiles of these, and future chameleon species, click the button below to find The Chameleon Enthusiasts Facebook group and search for “World Tour” to find the posts. You’ll get more pictures and breeding notes from Jurgen. It is a closed group, but answering two simple questions gets you in! 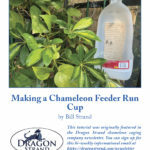 To watch a video on creating your own Chameleon Feeder Run Cup click here! As we come to the end of 2018 we are celebrating the 16thanniversary of the chameleon feeder run! 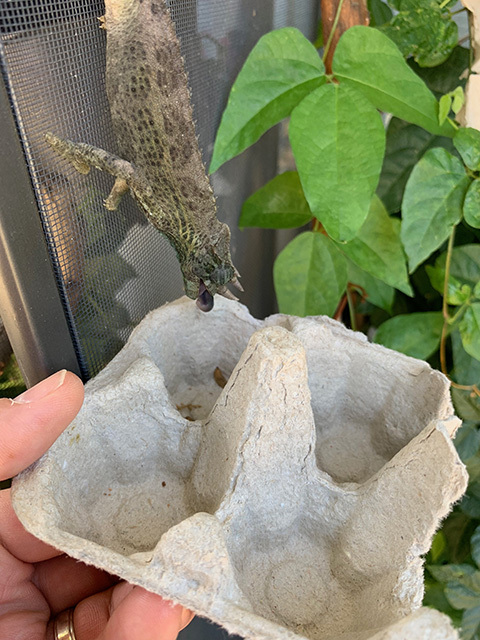 This concept solved the standard problems of feeder insects sitting in feeder cups not providing the required movement to attract a chameleon’s attention. By adding a back to the cup, the insects would climb and provide the movement to attract the chameleons’ eye, but still stays contained in their cup. 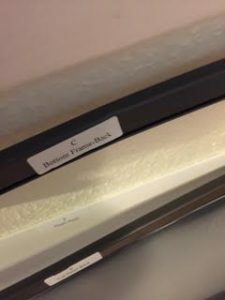 These feeder runs were first conceived and publicized in January 2003 in an issue of the Chameleons eZine by yours truly. (Click here for a slice of past goodness January 2003 ChameleonNews Hints and Tips) And it has been a staple in chameleon husbandry ever since. 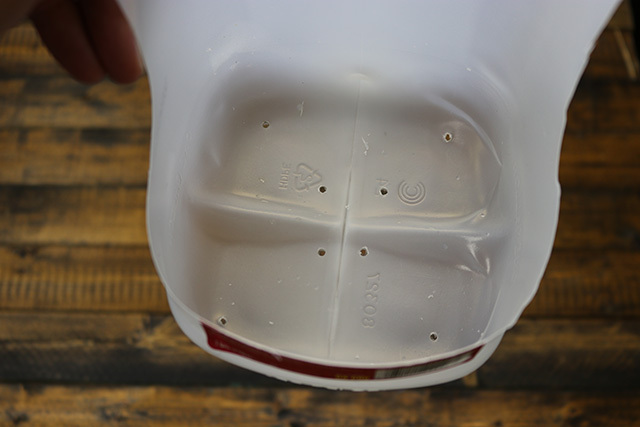 It works beautifully so I’d like to take this time to go over the basics in creating your own feeder run cups. 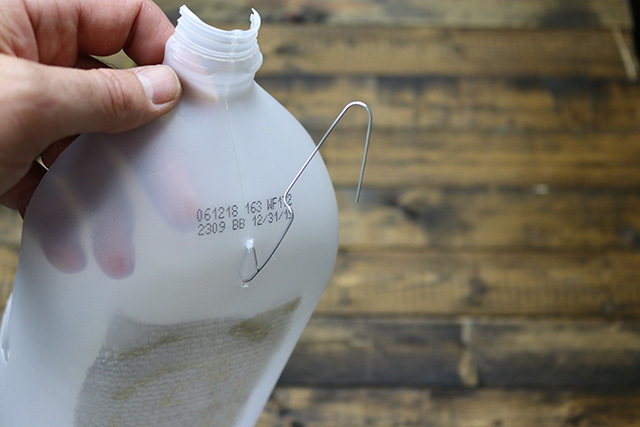 Cut an “L” shape out of the jug. 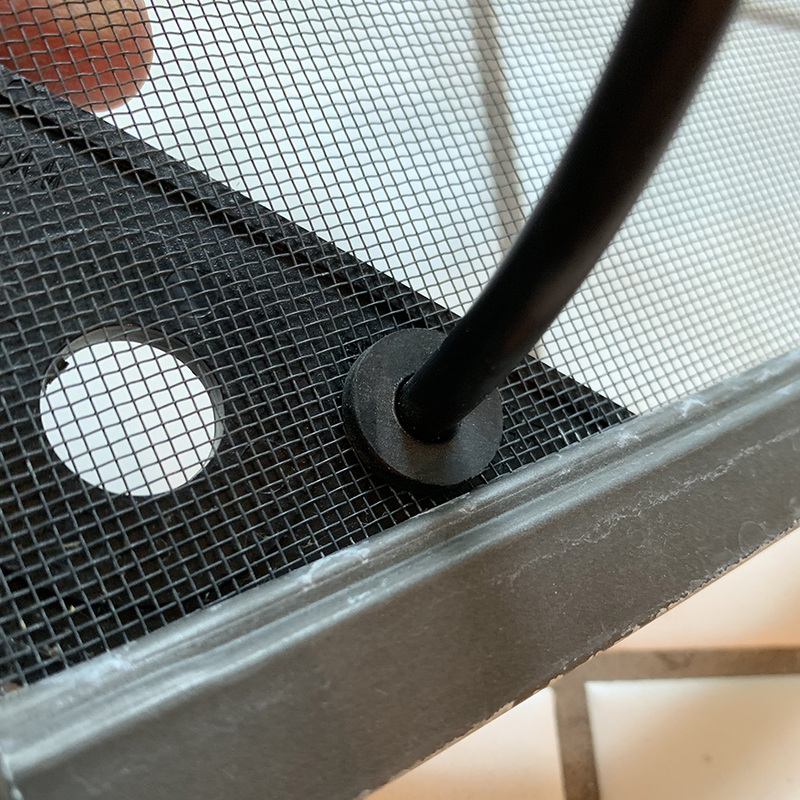 Tip 1: leave enough of a wall on the bottom that the feeder insects you use will not be able to climb out. 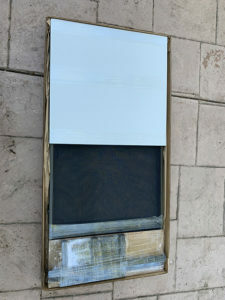 Tip 2: allow enough material on the sides of the vertical part so that the climbing insects cannot just reach over and grab the side to escape. Drill drainage holes in the bottom. 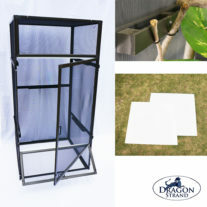 This is to ensure that the feeders do not drown or create an unhygienic mess if water gets in. 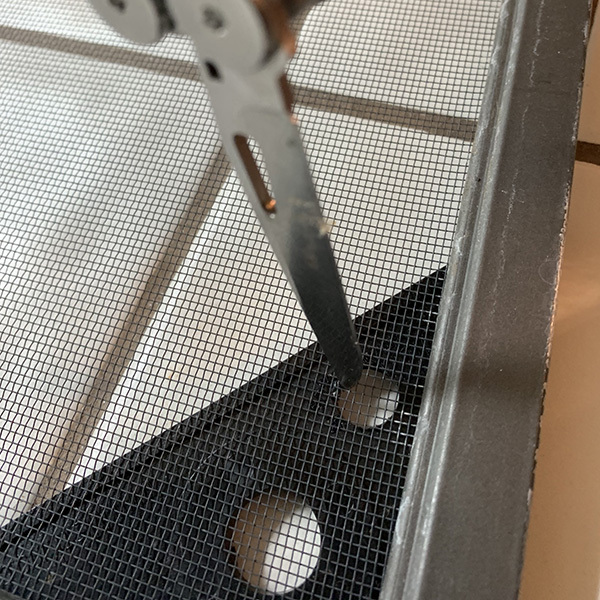 Obviously, keep the holes too small for the feeders to escape. 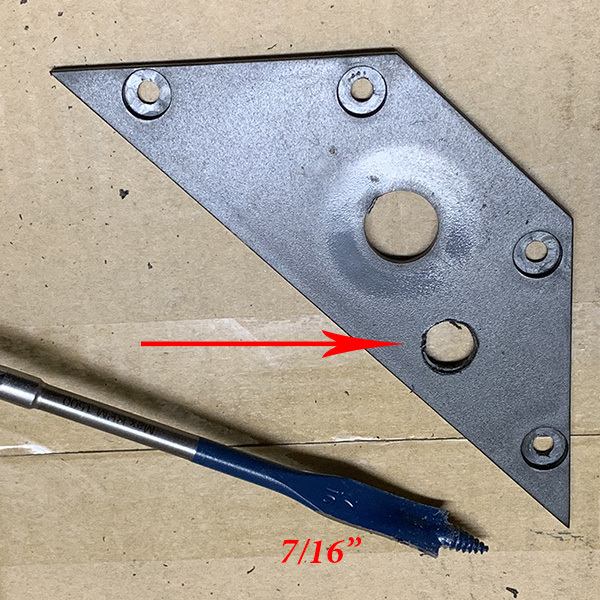 I use a 1/8″ drill bit. With the first ones I made I used fiberglass screening and made sure the edges were all safely glued. I now use sun shade material made of nylon as it is softer. 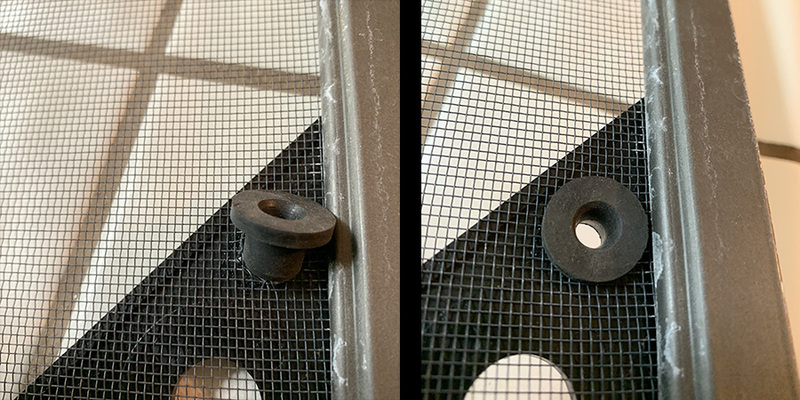 I glue the strip of sun shade using a hot glue gun, though silicone would work as well. 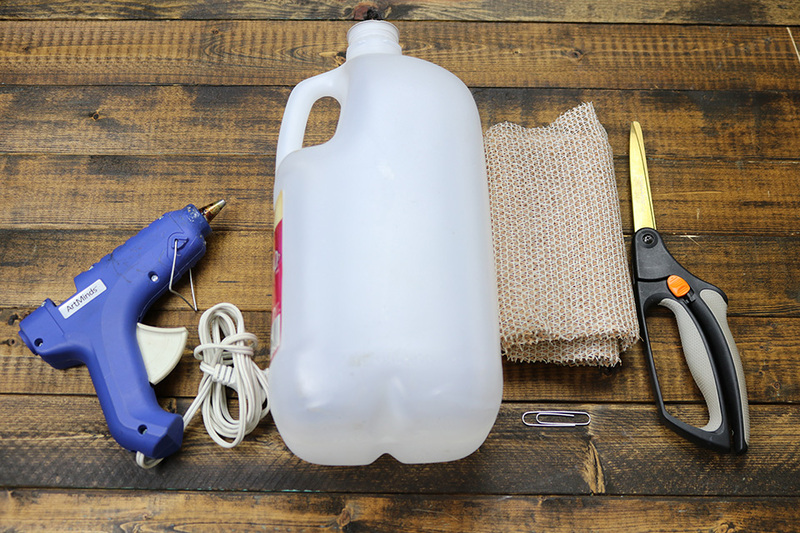 If you use nylon sun shade remember that it will melt with high temperatures so practice using the glue gun. I apply the glue and wait until it starts to cool before pushing down the sun shade. 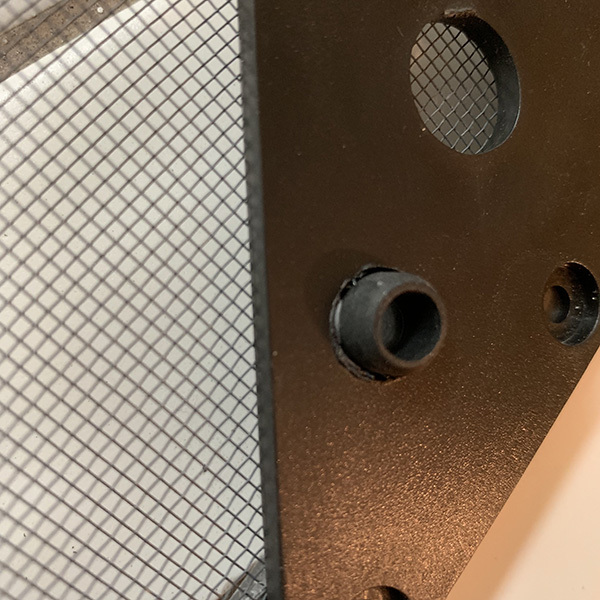 Two small holes drilled in the top, above the climbing cloth allow me to weave in a bent out paper clip which gives me an easy and convenient way to hang this feeder run in my cages. Now just hang inside a cage and watch your chameleon find its food! For maintenance, wash them after every usage. 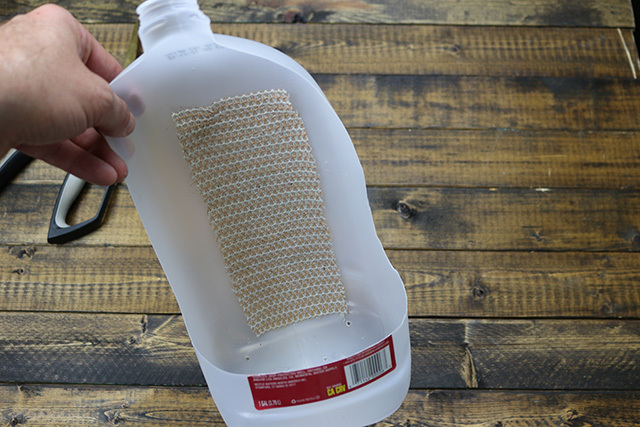 This is an easy and inexpensive way to make yourself some feeder runs! Now, this is a good way to make a lot of runs. But it looks pretty cheap. 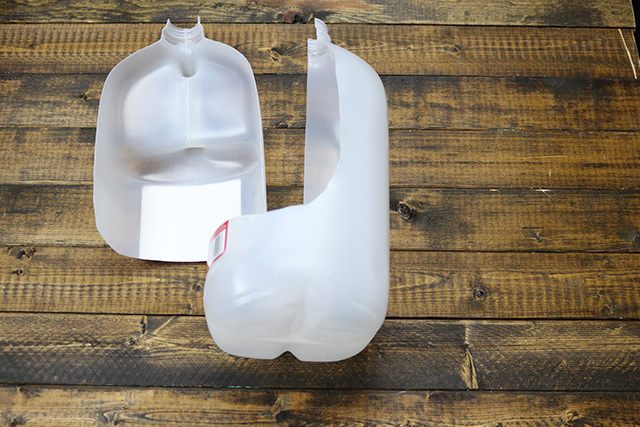 If you have a nice cage set-up that you put some work into, please do not put a cut-out milk jug in there! It is worth it to get a professionally made feeder run. My favorite is the one made by Nick Barta at Full Throttle Feeders. 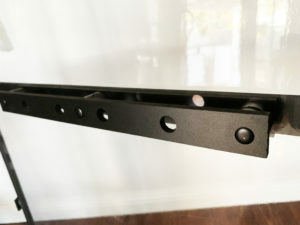 The feeder runs are attractive and are painted camouflage colors so they do not stand out. 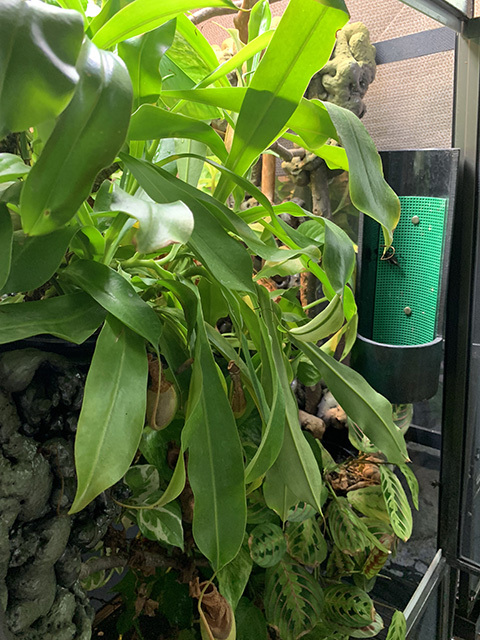 Since I do a great deal of taking pictures of my chameleons and their cages I picked up a number of the Full Throttle feeder runs and I am happy I did so. Nothing is more annoying than getting a great shot and seeing a plastic container in the background! 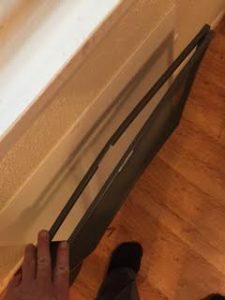 So make them and have a blast, but for the show cage in your living room, here is a link to the page for the classy feeder runs! 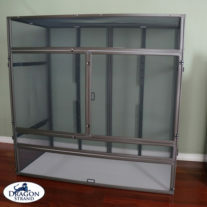 If you have a nicely set-up cage or one in your living room don’t ruin it with a plastic container! Do this! 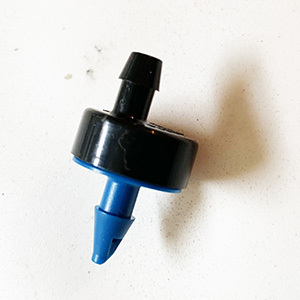 I know it isn’t standard for me to sending you to another company, but here is a link to Full Throttle Feeders where you can get the Chameleon Feeder Run shown above. Because, hey, I want the Dragon Strand cages to look their best! Let’s not show off a cheap feeder cup! 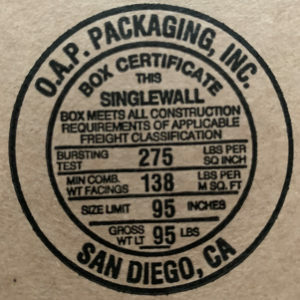 As of this blog post they are $16. With all the effort you have spent making the cage look nice, don’t stop at the last part. Q: What is the minimum size cage for a female panther chameleon? The simple answer to this question is truly the old saying “bigger is better”. The person asking the question is usually sincere and wanting to give their chameleon a good home, but not waste money. 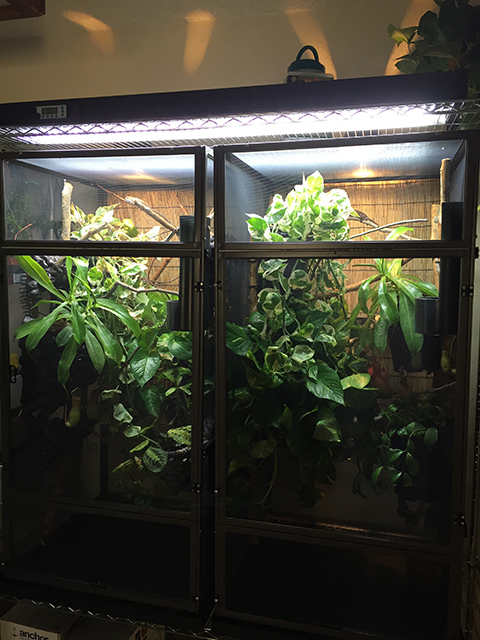 It boils down to the smaller the cage, the more difficult it is to create all the microclimates and gradients that our chameleon needs. Our margin for error, or not getting it perfectly right, goes way down. With a larger cage we have more options. We have a bigger space to work with (in relation to the size of our chameleon). The larger the space our gradients are spread over the more options our chameleon has to find a spot that has the conditions she needs. You have more opportunity to do it right. 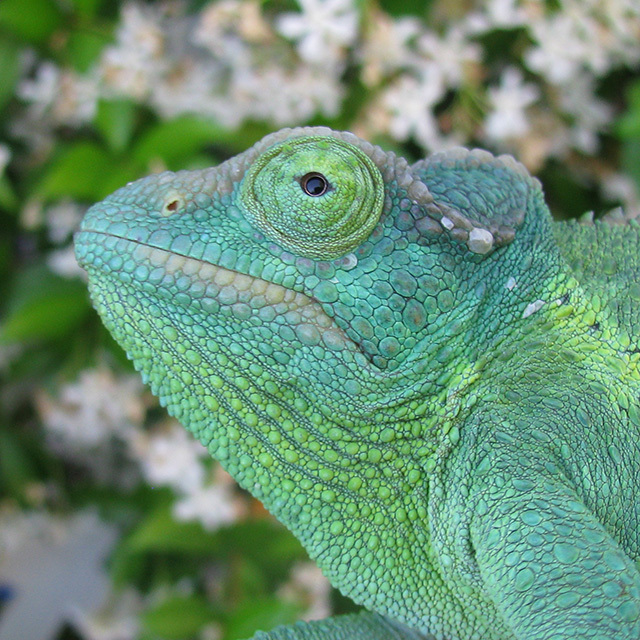 This female Panther Chameleon is in a Large Keeper Kit (48″ tall cage). With this much room she is able to fade in and out of the foliage. This creates a dynamic where I do not always see her and I love catching glimpses. 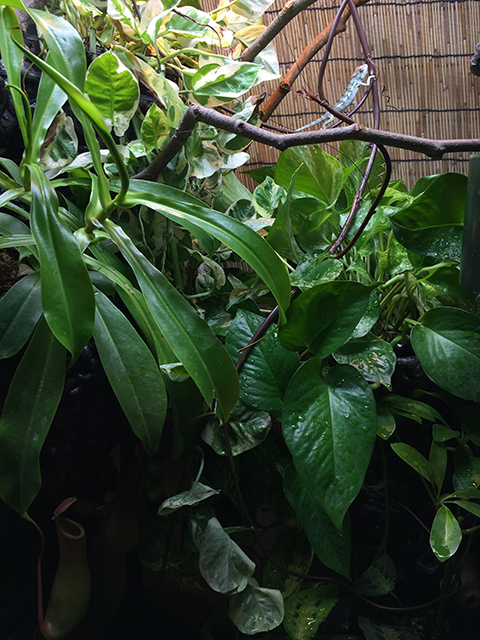 Here I was able to spy her through the Nepenthes leaves starting her shed. Way too often the females of the chameleons are just seen as part of a breeding program. They don’t usually have the colors or the horns. But take a look into the gentle eye of a female Jackson’s Chameleon or the incredible orange/pink of a female panther chameleon. They are incredible creatures on their own right and it is a great joy setting up a large cage where they can travel through different zones in the enclosure. 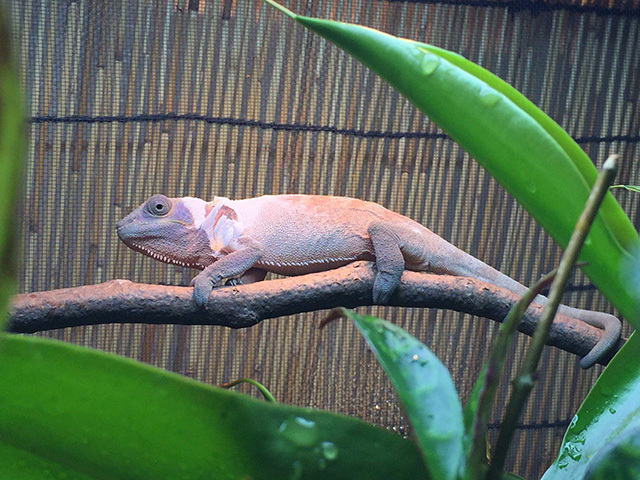 Female Panther Chameleons are an incredible orangish/pinkish color with purplish accents. Where else in the reptile world do you get to see these colors?